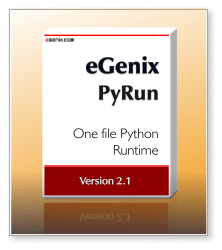 eGenix is pleased to announce our new open-source eGenix PyRun - One file Python runtime 2.1.2 for Python 2.6, 2.7 and Python 3.4.
eGenix PyRun's executable only needs 11MB for Python 2 and 13MB for Python 3, but still supports most Python application and scripts - and it can be compressed to just 3-4MB using upx, if needed. We provide both the source archive to build your own eGenix PyRun, as well as pre-compiled binaries for Linux, FreeBSD and Mac OS X, as 32- and 64-bit versions. The binaries can be downloaded manually, or you can let our automatic install script install-pyrun take care of the installation: ./install-pyrun dir and you're done. For a complete list of changes, please see the eGenix PyRun Changelog. Please visit the eGenix PyRun product page for downloads, instructions on installation and documentation of the product. For more information on eGenix PyRun, licensing and download instructions, please write to sales@egenix.com.